Barbie doll is usually synonymous with white skinny pants appeared with denim or other fashionable clothes. This time, the doll is changed after the discovery Hijarbie. Hijarbie designation Barbie is wearing a hijab. The new Barbie doll has been enliven social media, especially Instagram. Hijarbie dressed in a long gown, veil and abaya well. Hijarbie also look fashionable with the Islamic headscarf. 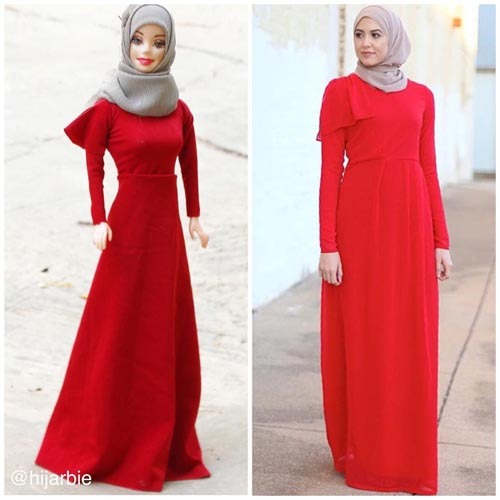 I think, I do not see Barbie wearing a headscarf before so I decided to open an account instagram and makeup Barbie with clothes that I make,” said Hijarbie maker, Hannefa Adam (24 years old) who are students of medical science as reported by The Independent. Haneefa, who just completed Master Barbie Farmakolgi in Britain described as ‘simple puppet’ that provides a model for Muslim girls. According to him, the doll is a great way to correct the misconception that says Muslim women are forced to cover themselves to express their religion. To transform Barbie into Hijarbie, he should order the doll from abroad. The reason, in Nigeria there is no Barbie is sold. After that, the display was changed barbie. In fact, he plans to transform barbie who have black skin. He wanted to show the diversity. I would love to decorate my own black doll as well. I have ordered some and they will soon be here, “he said. Currently, instagramnya account already has over 21 thousand followers. He has also received requests from around the world to buy a doll.